There used to be a time when the toughest part about getting a job was deciding where you wanted to work. All you needed in order to stand out from the competition was a college degree, or at the very least a glowing recommendation. These days, a Bachelor’s Degree is usually a requirement to apply for most jobs, and that only gets your resume piled on a stack along with 300 others. Actually getting your foot in the door for an interview is a whole different story. The reason why it’s so difficult to get an in-person interview is because the availability of greater variety allows employers to be selective. That seems to be the million dollar question these days. You can’t get an internship without experience and you can’t get experience without an internship—both of which you need in order to get a job! Lucky for us, we have the world at our fingertips and live in an age where technology and creativity can be the only tools you need to be successful. The hard part is figuring out how to make the most of these resources so you can reach your full potential. Be creative in how you present yourself and use a unique approach. One way to do this is to utilize the power of social networking sites or create a personal website to display your work. The possibilities are endless and I think it’s safe to say that a little extra hard-work and elbow grease doesn’t go unnoticed. 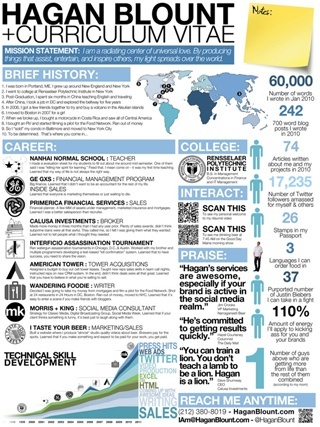 Below are two perfect examples of ingenuity and why turning your resume into an infographic is a fantastic idea. At a first glance, you can tell that both applicants spent a considerable amount of time planning and executing their design. 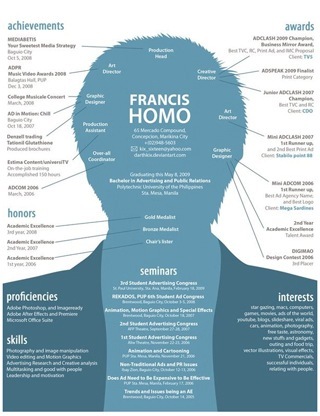 The first resume focuses on the visual presentation of information and facts. There are QR Codes to view press highlights and additional portfolio items as well as a section for praise from previous employers. The second applicant took a more creative approach. Their strengths and accomplishments are listed in relation to the corresponding area of the brain, and there is some insight about their own personal interests. Both resumes are creative, unique and sure to leave a lasting impression. 2. Find your niche and conquer it. Discover your strengths and capitalize on them. It’s better to cut your losses and focus all of your talent and energy on what you’re good at instead of trying to accomplish everything. I don’t mean quit and give up every time you aren’t good at something. I’m just saying that it’s better to dedicate 100% of yourself to areas where you show promise instead of splitting your focus and trying to work on other areas where you fall short. Take the West Virginia Ninja for instance. This man makes YouTube videos showing viewers how to become a proper ninja. He demonstrates some of his moves—not to be tried at home!—and provides tips on how to use common items to defend yourself. I can’t verify whether or not Diemon Dave has a line of people at his door waiting to sign up for his self defense classes, or if there’s a high demand for online ninja tutorials. But I can tell you that he has built a noteworthy reputation for himself with 3,822,029 views on YouTube. I’m sure there are thousands of ninja instructors scattered across the United States, but I can’t name any of them. I can however, reenact a few West Virginia ninjin’ maneuvers courtesy of YouTube. Let your personality mold whatever it is that you’re passionate about. You need to make your delivery unique, even if your area of concentration is not. It’s also crucial to make sure you leave a lasting impression. Fashionista Talk is the personal style blog of Lida Mankovskaya, a law school student living in California. She posts pictures of her various ensembles with a short paragraph or two describing the inspiration behind them. She also has sponsors for her blog along with monthly giveaways where her readers get the chance to win designer items. There must be over a million fashion blogs on the internet, but Lida managed to set hers apart from the clutter and developed a brand for herself online—whether she intended to or not. 4. Bring out your inner superman. Reveal your talent and become infectious. We live in a reputation economy where having 10,000,000 views on YouTube or 8,000 followers on Twitter is sometimes enough to get noticed. Bo Burnham, another YouTube sensation, got his start singing satirical rhymes in his attack. His most famous song ‘i’m bo yo.’ got 19,078,520 views on YouTube and landed him a recorded performance in London for Comedy Central’s The World Stands Up as well as a four-record deal with Comedy Central Records. I’m not saying that everyone will be the next Bo Burnham, but I am saying that you will never succeed if you don’t try. Create a fan base and share your genius. Oprah didn’t become one of the most influential women in the world overnight. The same goes for building an online audience…it takes time. Podcasts are an excellent way to showcase your talent and expertise. The Nerdist, a geeky yet hysterical podcast by comedian Chris Hardwick, has done an excellent job building a fan base online. Chris Hardwick has 1,722,576 Followers on Twitter and the Nerdist Channel has 19,544 Followers, 1,044,151 +1’s on Google and 72,617 Likes on Facebook. Word-of-mouth and reputation play a big part in determining who is a valued member of the online community. Websites, blogging, social networking and video blogging are all FREE to use! So if it helps you get a leg-up in the application process, why wouldn’t you take advantage of these internet platforms? 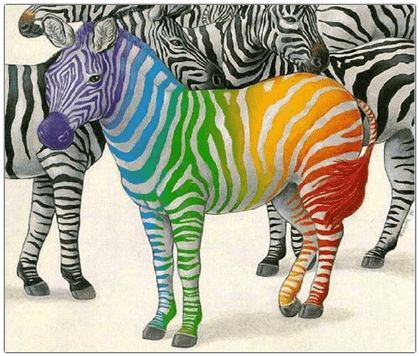 Don’t be afraid to show your true colors!